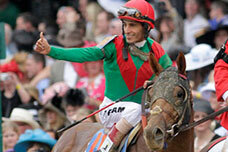 JOHN R. VELAZQUEZ is a two-time Kentucky Derby winning jockey. In the 2017 Kentucky Derby he rode Always Dreaming and in 2011, he guided Animal Kingdom to thrilling victories. Velazquez was inducted into the Horse Racing Hall of Fame in 2012, rode his 5,000th winner in 2013, and became the leading money-earning jockey in the history of the sport in 2014 and both years was given the Eclipse Award for Outstanding Jockey. He is a winner of fifteen Breeders’ Cup and four Triple Crown races including the 2011 and 2017 Kentucky Derby. Velazquez has also won major graded stakes races such as the Kentucky Oaks, Metropolitan Handicap, Whitney Handicap, Dubai World Cup and Woodbine Mile. 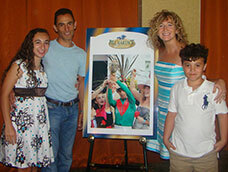 Velazquez was born in Carolina, Puerto Rico and learned to ride there, attending a jockey school for a year and a half. He came to mainland United States in 1990. Honing his skills at New York’s Saratoga Racetrack, Belmont Park and Aqueduct Racetrack he has succeeded at winning races on the track while providing industry leadership off the track. Velazquez is married to Leona O’Brien, the daughter of trainer Leo O’Brien. The couple reside in New York and are the parents of two children, a daughter, Lerina, and a son, Michael Patrick.